LEMIS process DC42 series of process liquid density/viscosity meter is ideal for real-time, in situ monitoring and control applications within the oil and gas, petrochemical, chemical, food processing and other industries. Use the proven vibrating element technique which is widely accepted as the most accurate method of continuous on line density measurement, LEMIS process engineers did new step ahead introducing unique proprietary design of resonant tube sensor allowing accurate measurement of liquid viscosity along with its density. 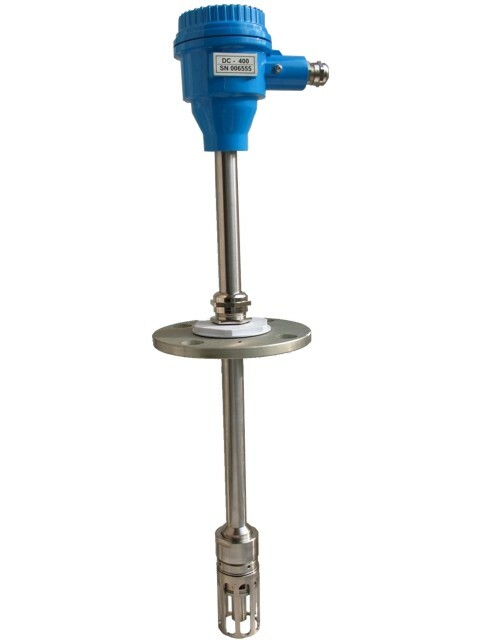 An integral high accuracy Pt100 probe continuously monitors liquid temperature allowing temperature compensation and future calculation of reference viscosity, density, concentration or specific gravity. The technology proves high accuracy of measurement and long term calibration stability even in sever operation conditions. It is insensitive to plant vibration, high variation of temperatures, level, mix or turbulence. The new sensor offers to plant engineers the ability to measure simultaneously and continuously both critical variables of the process liquid in one device saving cost of installation and maintenance. The DC42 series covers wide range of density, viscosity and temperature. Numerous installation options give large flexibility to fit various applications. The sensor can be directly inserted into the opening in a tank wall or can be submerged into a tank at desired level up to 30 meters. This technique can be employed in open or pressurized tanks and reactors. Large choice of process connection flanges is available. The meters have approvals for use in hazardous areas. A choice of wetted parts materials : from stainless steel for general industrial use, Ni-SpanC for most demanding applications, and Hastelloy for applications where ultimate corrosion resistance is required. If you have specific requirements over the standard list, we can tune system specification for your specific needs.